Here comes another web site which you can surf and earn, it's unlike other online money making web site which make you sick for wasting time and just get a very minimal return. 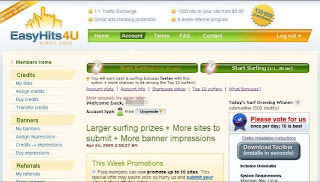 Now, EasyHits4U is the one to choose where you are paid to surf. Step 3: Click on the correct word as appear in the grey box and then it will proceed to the next guess. 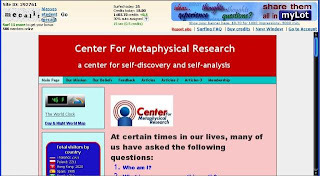 It will repeat but you need to wait for 15 seconds(or sometimes 30 seconds). Do as many as you like in a day and the earnings are up to you to determine. 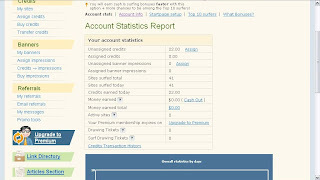 :-) You can check your earning by clicking to your account page and check your account statistics report as showing below.